The Solar Dynamics Observatory captured an array of images of a solar flare on Aug. 24. This one spectacularly shows the locus of the flare, on the left side of the sun. This image of the Aug. 24, 2014 solar flare was captured by the Solar Dynamics Observatory at 5:16 am MDT. 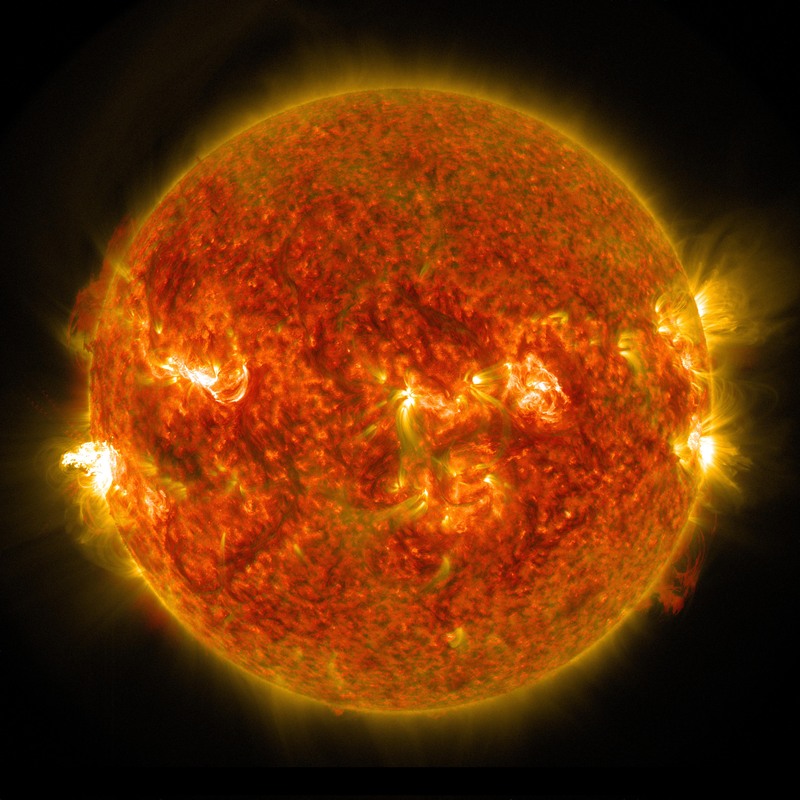 Image courtesy NASA, SDO. You can see more images of this week’s flare at SDO’s Facebook page or on the mission website. Solar flares are energy releases. They happen when electrons, which carry a negative electrical charge, encounter the sun’s plasma. When that occurs, an explosion occurs and the particles are rapidly heated. Accelerated to very high velocities, they then move through the sun’s atmospheric layers and disperse into the solar system. When they reach the vicinity of Earth, they can pose a radiation hahttps://wordpress.com/post/zard to spacecraft and the astronauts inside them. Solar flares are sometimes accompanied by an independent phenomenon known as a coronal mass ejection, in which atoms and ions are expelled from the star and sent on a high-speed journey through space. Coronal mass ejections can damage satellites, including those that transmit worldwide communications and provide geographic positioning system information, and disrupt the transmission of electricity on the planet. They can also impair the functioning of electronic devices on board high-altitude aircraft. This week’s solar flare was not among the most powerful known to occur on the sun. Scientists measure the intensity of a flare according the amount of flux they produce in x-rays near Earth. There are five classes, ranked from weakest to most powerful: A,B, C, M, and X. Each of the classes involve flares that are about ten times more powerful than the next-lower class on the scale. Within each class of solar flare there are numbered divisions that allow a more precise distinction between solar flares to be drawn. Sunday’s event was an M5 flare, which means that it was not as powerful as the X5.4-class flare that occurred on March 6, 2012, the X5-class “Bastille Day Storm” on July 14, 2000, or the X17-class (or maybe even an X28-class) event that wowed scientists in October 2003. 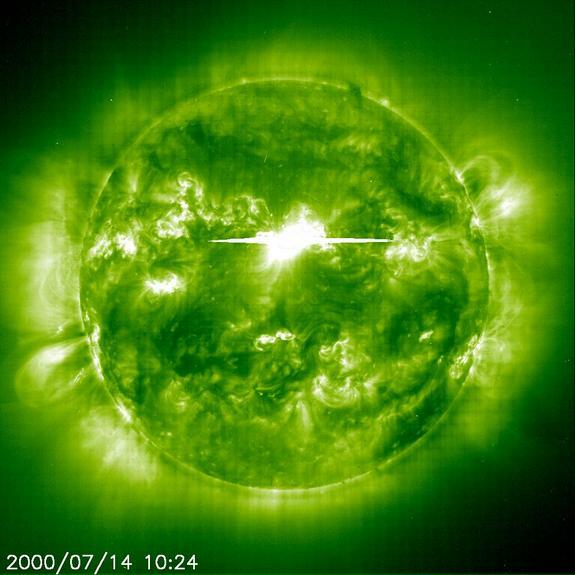 The October 28, 2003 flare was powerful enough to induce the European Space Agency to put its Solar and Heliospheric Observatory in a “safe mode,” so that sensitive instruments on board would not be damaged. The event caused numerous aircraft flight delays and forced astronauts aboard the International Space Station to take cover in an area shielded from the solar radiation. The operation of several satellites in Earth’s orbit was disrupted and even space probes as far away as Mars and Saturn were affected. This image of the Oct. 28, 2003 solar flare was captured by ESA’s Solar and Heliospheric Observatory. 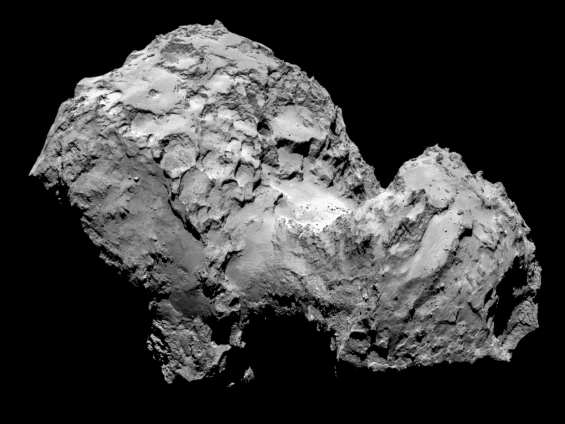 Image courtesy ESA. The Bastille Day storm caused some radio broadcast disruptions and some damage to satellites. You can learn more about well-known solar flare incidents here. This image of the July 14, 2000 Bastille Day storm was captured by the European Space Agency’s Solar and Heliospheric Observatory. SOHO used its Extreme Ultraviolet Imaging Telescope to capture it. 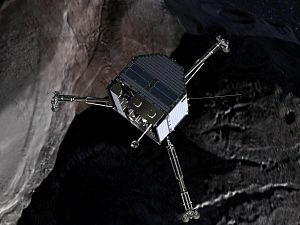 Image courtesy ESA. A draft United Nations report has bad news on climate: greenhouse gas emissions are rising faster than the efforts to contain and reduce them are succeeding in lowering them. Today’s New York Times article said that the draft report concludes that “severe, pervasive, and irreversible impacts” are unavoidable unless the trend is reversed within a decade or two at most. Among those impacts that are already occurring are increases in sea levels, extreme weather phenomena including heat waves and heavy rains, lowered grain production, and losses of polar ice. According to a Nov. 2013 report by the World Meteorological Association, worldwide GHG emissions hit a record in 2012, with 35.6 metric tons discharged. In fact, the decade 2000-2010 was the warmest in the historical record. Climate data has been obtained and archived around the world since about 1850. During 1970-2000, GHG pollution rose by only about 1.2 percent per year. The IPCC report was released to governments around the world earlier this month for comment. It is due to be released to the general public on Nov. 2 in Copenhagen, Denmark. 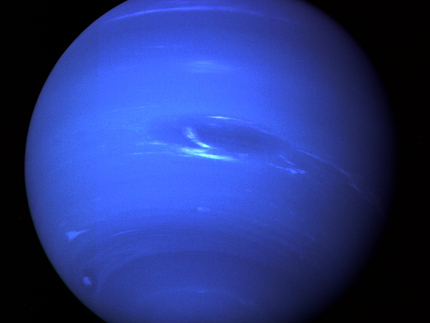 Neptune, as seen by Voyager 2 on Aug. 20, 1989. 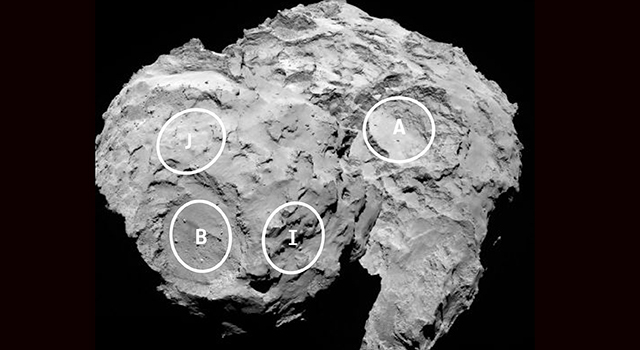 The photo was obtained after the probe’s on-board camera took multiple images while traveling about 4.4 million miles from the planet. The Great Dark Spot is visible near the center of the image. Photo courtesy NASA. As the one hundredth anniversary of the passenger pigeon’s extinction approaches, the National Museum of Natural History is giving Americans the chance to see the last individual of the species. The stuffed remains of Martha, who died at the Cincinnati Zoo on Sept. 1, 1914, will be posed on a branch for the display. Passenger pigeons once numbered in the billions. At one time it was the most abundant bird on Earth and accounted for at least one quarter of all individual birds in North America. Ectopistes migratorius was a fast flyer. One scientist estimated in 2002 that the bird could travel at a velocity exceeding 60 miles per hour. Passenger pigeons could also travel long distances, migrating in huge flocks that routinely numbered in the millions or more. The display at the Smithsonian Institution museum in Washington, DC will also include specimens of the heath hen and the great auk, other notable examples of bird species driven to extinction by humanity. This website provides information about the exhibition, entitled Once There Were Billions: Vanished Birds of North America.